Through our number 959 87 22 05 (10 lines, low cost call), When making the call, you will have to provide the name of the product or its reference (the ref, appears below the article name on its description page). ) number of units, shipping address and payment method. In the address info@gran-scooter.com, also indicate the name of the product or its reference (the ref, appears under the article name on its description page) number of units, shipping address and payment method. You can add the products to your shopping cart by clicking on the add button, you must create a personal account, where you will provide us the billing and shipping information, then you can decide how to send and pay. Afterwards, send us a copy to the email info@gran-scooter.com or a fax to the number (+34) 959 87 22 05. Do not forget to specify your fist and last name, as well as the order number. IMPORTANT! It will not be accepted any copy of orders where our account number does not appear. Once the purchase will be confirmed, you will be automatically restricteed to a secure server HTTPS, where you can proceed to the payment. You will need your card number, expiration date and security number of your credit card which is in the back of the credit card. New payment in one click!! Enter your card data only once. For your next purchases you only have to enter the code that arrives to the phone associated with the card, more information here. Pagy your order to the transport company once you receive it. This form of payment entails a small commission charged by the transport company fot the management of the collection and delivery of the money to our company. This commission is €4.90 for orders less than €150. For orders with an amount greater than €150, the commission charged by the transport agency is 3% of the total. Important: In the case of very bulky products such as electric scooter of the family "City" and due to its high transportation cost, you must make a deposit of €50 before sending your order by cash on delivery. These €50 will be deducted from the total to be paid. Orders for registered motorcycles can not be sent by cash on delivery, except if you are not registered. Shipments to Portugal for cash on delivery can not exceed €999.99, because transport companies in Portugal can not collect amounts higher than that. For this, we will ask you to make a transfer with the difference, which will be deducted from the final amount. Then, you must pay €999.99 to the carrier. Pay your order with your PayPal account. It will be necessary that the shipping address you hace in Paypal is the same as the shipping of the order. This payment method has a commission from PayPal. Before finalizing the order, you can review the amount of the commission, since it is calculated directly by the system and shown before confirming it. Make the purchase without paying anything, and pay up to 7 days after receiving the product at your home. No fees, no interest. Forget paying interest to transportation companies! You can pay by bank transfer or a credir or debit card. Sequra has several bank accounts: La Caixa; Sabadell; Santander; BBVA; Bankia. Do you have any extra cost? There is no interest rate or extra cost. Pay only the proce of the product. Once the order has been sent, you have 7 days to pay for it. Sequra will send you and email at the time your order is shipping. In this email, in addition, forms and payment guides will be added. Finance your purchase up to 3, 6 or 12 months. Without any interest, you will only have to pay small and comfortable fixed fees. The TIN is 0.0%, paying only the fixed cost per installment. How to know how much you have to pay in each installment? Do not worry! The exact amount to be paid for each fee will appear in the shopping cart before finalizing the order. For returns, credit card changes or paying the fees for transfer you will have to contact with Sequra. Sequra reserves the right to not accept credit, any incident with them you can contact the financing company through the customer area of Sequra or by calling (+34) 931 760 008. The web automatically calculates the Shipping Costs according to several factors such as weight, volume, shipping area, offers associated with shipping costs, etc., therefore the company reserves the right to recalculate the shipping cost, notifying the customer of the new amount, if the client does not accept this new amount, the order will be canceled, reimbursing the total amount paid. All orders will be insured at 100% of their value, for any claim due to transport you must notify us within 24 hours of receipt. As long as your order is free and with large volumes, you will be sent to the transport company Redur, which will deliver your package in approximately 24-48 hours. We make a great effort to lower shipping costs, but we have no choice but to apply part of them. Peninsula & Balearic Islands 24/48 / 72h depending on product. Our goal is that all orders made before 18: 30h are delivered the next working day in the whole Peninsula and 48 / 72h in the Balearics, (provided they are small packages of maximum 30kg) although that is our goal and 94.8% of the orders of the last year have fulfilled those 24h of term, it is possible that a minority of them are delivered in 48H, either for internal logistical reasons ours or of the transport company with which we work (Correos Express, Seur, Dhl, Redur, always First Level transport agencies). For packages of + 30Kg, such as Electric Motorcycles, CityRoad, Citycoco, Citycoco Mini, CityStreet will be sent by parcel companies (not of courier service) and therefore being delivery in 48 / 72H. You will always receive an email indicating the transport company for which your order travels and the tracking number to be able to control where your order goes at each moment. Important: Bulky products such as the Citycoco or similar Motorcycles can not travel by courier companies (small packages) and travel by courier companies (such as Dhl, Redur ..), These products travel totally protected, in metal cages and on pallets of wood. These products will have a delivery time of 48 / 72H in the peninsula, and a day or two more in the Balearic Islands due to the fact that they have to change the ship for the Islands. Also for this reason, the transport to the Islands is quite more expensive, so the transport of the Citycoco we have to add + 45eur of shipping costs to the Balearic Islands. Canary Islands, Ceuta or Melilla 3-6 days. Due to recent changes in shipping rates to these locations it is not possible to calculate the shipping cost automatically, as it depends on many factors, so to know you contact our sales representatives and they will make a personalized quote at no cost any. We also accept the collection in the store, if you already work with a transport company, only indicate in the transit step with which company you will pick up. IMPORTANT: Do not make the payment until you know the price of the shipment, unless you send your company to pick up. European countries to which we ship: Austria, Denmark, Belgium, Bulgaria, France, Slovakia (Slovak Republic), Slovenia, Estonia, Finland, Greece, Hungary, Italy, Lithuania, Luxembourg, Malta, Poland, Germany, Ireland, Netherlands, Sweden, United Kingdom. We have summarized in 7 points the main reasons why you can trust us and buy at Gran-Scooter.com with total confidence. You can check our company in the Spanish Companies Ranking of this link: National Companies Ranking. We are the Company Position 38 at the National Level of our Sector !, Although it is a Large Company, we do not stop giving a close, familiar, and committed to our customers. That is one of the reasons for our continued growth, seriousness and professionalism. Since 1997, we have been in the computer world and since 2001 in the electronics industry, thousands of clients during these years have been attended and we have learned from every error, every failure, we always look for a more efficient way to work. Compatinet SL is a company with a great National recognition. All our products have 2 Years Warranty. It includes all repair costs, parts, labor, shipping costs to our facilities is supported by the customer, return shipping if it runs on our behalf, We are so sure of our work, we can offer that guarantee, since the rate of failures in so many by the way is very very small. We have available to customers the section comments, in it the customers express how it has gone with our company, do yours, or read the comments of others. We spend a lot of time creating manuals to use our products, videos, photos, downloads. Everything the user needs to know how to use and make the most of their product. Some manuals have been devoted several days to their realization. All our shipments are insured at their value again, if for any reason during transport there is a problem that will damage the item you will be refunded the full money of that product or you will be given a new one, without waiting, without dizziness, that is, We only ask that you inform us before 48 / 72H of the transportation breakages, since this is the deadline given by the shipping insurer. We fight daily to have the best prices on quality products. We are direct importers, we have great agreements with the main brands and we are distributors of large chain stores in the sector. By importing and manufacturing directly, intermediaries are avoided that make the product more expensive. We serve by our online chat, by email and also by phone, you can contact us directly on the phone 959 87 22 05 (10 lines) or you can visit us at our facilities in San Juan del Puerto (Huelva) where we have more than 5000 square meters of warehouses, and offices with more than 20 jobs. ReturnsChange of idea? Are not you happy with the product? It occurs when the customer wants to return any product without any type of incident, either by repentance, change of mind, or that the product, although it corresponds exactly with the description and photo of our website, is not liked by the buyer. You can return it without further question. The deadline to communicate this return is 14 calendar days from receipt by the customer, in case of a holiday, leave a record by e-mail of the intention of the commercial return. To do this you must enter your user area and fill in all requested information. Once we have received it, we will proceed to process the return.? We will contact you to inform you of the acceptance of the return, and the delivery address, which must be clearly indicated on the packaging. You must deliver the product to us within 10 days from the date you were informed of the acceptance of the return. The products have to arrive in the same state in which they were sent, that is, they must not have any type of use, be fit for sale, including all their accessories, manuals, etc. In case of missing accessories, they could be deducted from the amount of credit for their replacement, they must go with all the components of the same. If the product is not returned in conditions for sale, the amount of the return of the product to its original state could be charged. Gran Scooter will proceed to refund the money within a maximum period of 14 days, once you have received the product and verified that it is in perfect condition. Throughout the process, we will keep you promptly informed through email. It occurs when the product delivered does not match the one specified in the order or has been hit and damaged externally during its delivery, or it detects that the product does not work correctly before 48 hours after receiving it. If this happens, you must communicate immediately, and within less than 48 hours of receiving it, to Gran Scooter by sending an e-mail to info@gran-scooter.com. Once we receive this e-mail we will begin to process your return. If you received the damaged packaging it is very important that you indicate it on the delivery note of the carrier at the time of receipt. We will contact you by e-mail indicating your return number that you must clearly indicate on the packaging. Later, we will send a transporter to your home for collection, and we will proceed to send you the correct product. In this type of return, all the costs of collection and new delivery will be covered by Gran Scooter. This section applies to all products with failures or breakdowns after 48 hours of receipt. It occurs when the product does not work properly or has stopped doing so due to a technical problem within the term established in the Guarantees Law, 2 years guarantee for the end customer and 1 year warranty for the Distributors. Gran-Scooter Offers 2 years warranty to the end user also in the batteries of all products.? To process a guarantee it is essential to attach a copy of the invoice. -If they have received, once delivered to the customer, any deterioration due to external events, accidents, poor follow-up of the instructions or change in the electrical tensions. -If they are damaged due to improper configuration or installation of the software, hardware and peripherals, by the client. -If there is a fault caused by a component not supplied by Gran-Scooter.com. -In your case, if the general conditions imposed by a manufacturer for a product so indicated. To do this you must enter + Client Area> My Users area> Returns> New return. -Number of reference of the article. 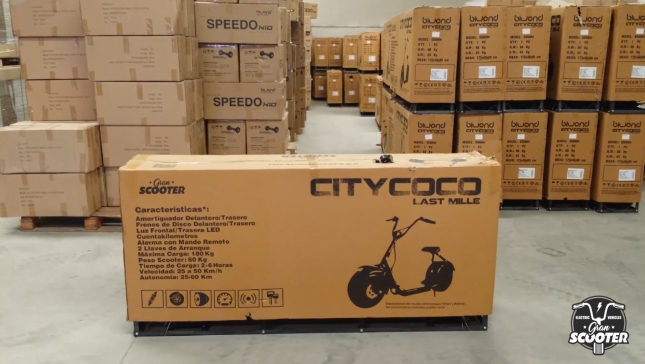 In this type of return, the customer must send the product to our SAT for repair, by any means (mail, transport companies, or in person in our stores), and Gran-Scooter will send the cost and insured product to the customer from our warehouses. Once the return has been processed by our SAT, whose resolution means the payment by the client for its withdrawal, you will have 2 months of free storage in our facilities. After the deadline, the cost of storage and custody by RMA will be 1.50 € / day elapsed. The maximum storage period from the resolution of your return will be 6 months, after this period without receiving notification from the customer, the material will be recycled, losing the right to a later claim. Sales prices may vary without notice and except misprint all prices INCLUDE TAX. Sign in and enjoy our discounts. Join more than 65000 users in Europe. Do not waste time and enjoy great benefits by registering as a particular. Join more than 12000 distributors in Europe. Do not waste time and enjoy great benefits by registering as a distributor.